Born 1945, Carol Sproston first studied at The Lydgate Art Research Centre, and subsequently, since 1998, with artist/teacher Graham Sproston. Carol Sproston has always been interested in abstraction, and some of her paintings are initially produced purely from abstract shapes and colour, others from a figurative subject, as the starting point. Either way, her work is then allowed to develop and evolve unpredictably as form and content change, and are then re-established. 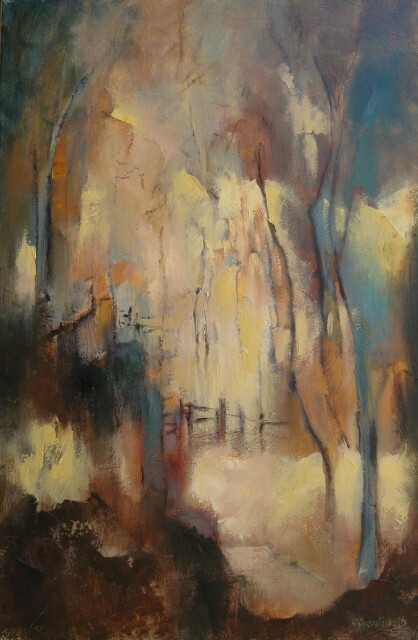 All her works are in oils, and although the paintings have suggested titles, they remain open to interpretation. In the last few years Carol has exhibited in London and regularly in the west country.